Record winter rainfall during the 2016-17 winter has enabled farms to emerge from survival mode in the short term, but scientists are still working hard to be ready for the next drought, reported Tim Hearden in Capital Press. Hearden spent a day at the UC Kearney Agricultural Research and Extension Center in Parlier to learn how researchers at the facility and the UC West Side Research and Extension Center near Five Points are combining technology with management practices to put every drop of irrigation water to work. 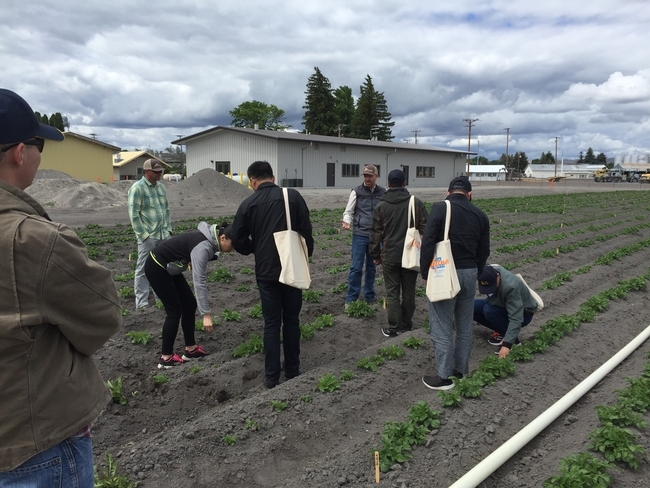 At the West Side REC, researchers are working with farmers to perfect micro-irrigation efficiency and test drought stress on the area's most prevalent crops. 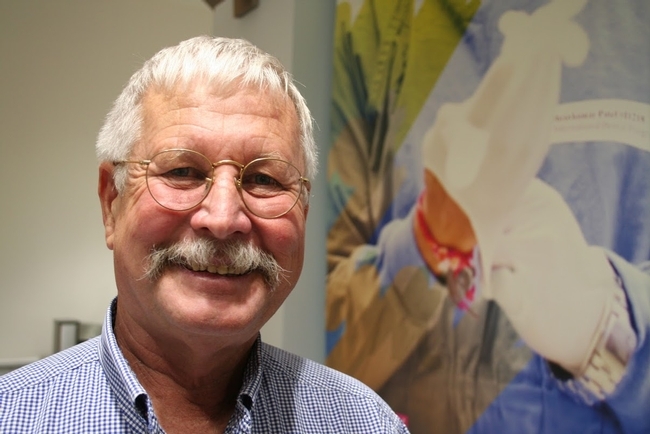 “We'll grow a tremendous number of cultivars of a crop” and identify “what seem to be the most promising cultivars when you grow them under drought conditions,” said Bob Hutmacher, a cotton specialist and the center's director. Overhead irrigation is one of the promising techniques being used in conservation agriculture systems. Hearden spoke to Jeff Mitchell, UCCE cropping systems specialist and director of the Conservation Agriculture Systems Innovation center (CASI). 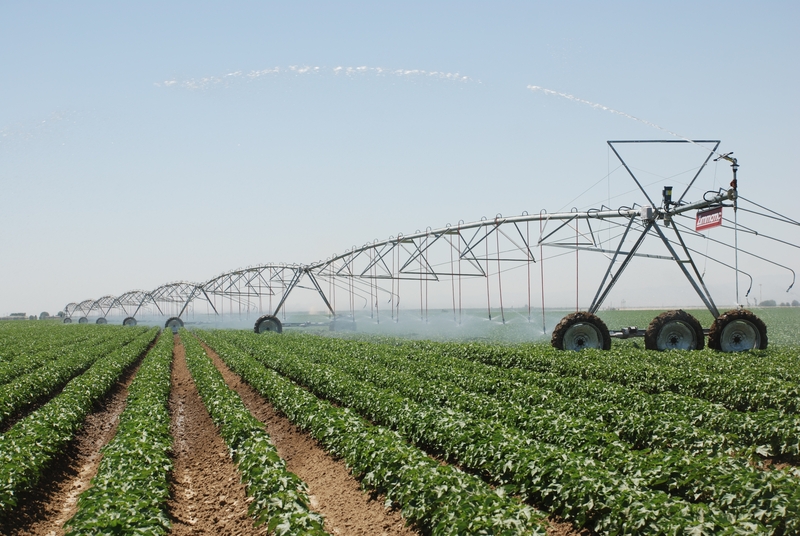 CASI is encouraging farmers to adopt farming practices that save water, reduce dust and help improve the condition of soil, such as subsurface drip irrigation, overhead irrigation, minimum tillage, cover crops and crop residues. 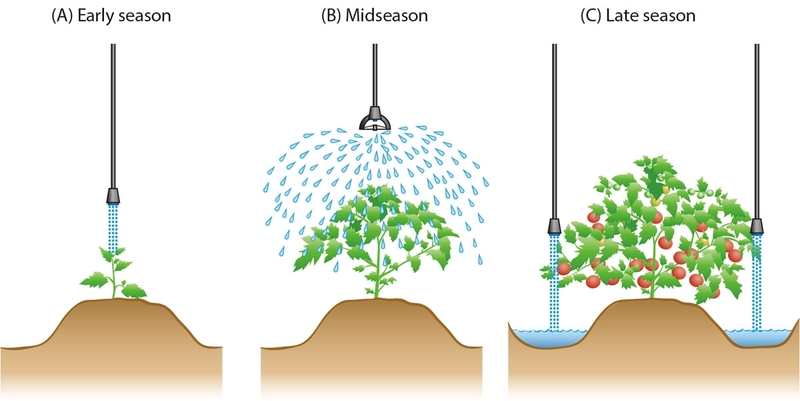 Other subsurface irrigation trials are showing dramatic increases in yields. Khaled Bali, an irrigation water management specialist at Kearney, said underground drip systems in alfalfa fields have achieved 20 to 30 percent more yields while in some cases using 20 percent less water. Kevin Day, a UCCE pomology advisor in Tulare County, is trying subsurface drip in a peach and nectarine orchard after working with the USDA to use it for pomegranates. He's seen as much as a 90 percent reduction in weeds because there's no surface water to feed them. Improved soil promises to help farmers use less water and reduce carbon in the atmosphere, reported Ezra David Romero on Valley Edition, a one-hour weekly program that airs on KVPR-FM. The five-minute story, which begins at the 30:30 mark, focuses on CDFA's new Healthy Soils Initiative. The program is expected to allocate $7.5 million for farmer incentives to use practices that will improve soil health and reduce greenhouse gas emissions. 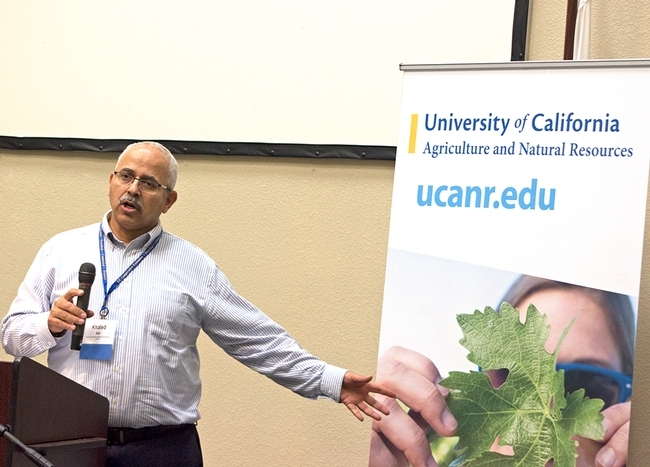 These are practices that are already in place on some innovative valley farmers, including two that are active in the UC Agriculture and Natural Resources' Conservation Agriculture Systems Innovation center. Jesse Sanchez, manager at Sano Farms in Firebaugh, said 15 years ago, tractors were rolling across the 4,000-acre tomato farm all the time. Now, the farm features cover crops in the winter, reduced soil tillage, irrigation with super-efficient buried drip tape and lower fertilizer needs. The result is a one-third drop in water use and a 75 percent reduction in diesel to fuel tractors, Romero said. Many of the farm's tractors have been sold. "We don't want to see them no more," Sanchez said. 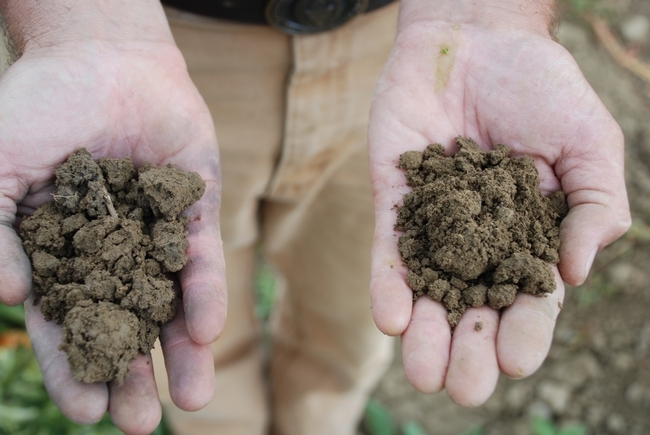 Healthy soil practices are evident in the soil on right compared to standard soil on left. 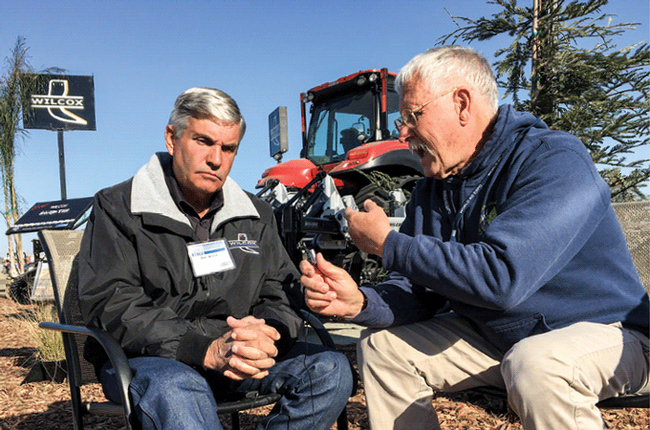 Retired Madera County farmer Tom Willey discussed the critical importance of soil care he learned as a long-time organic vegetable grower. "It's the survival of our species," Willey said. "The soil is the thin skin of the earth that we all exist on. Our lives are bound up in the health and productivity of the soil." 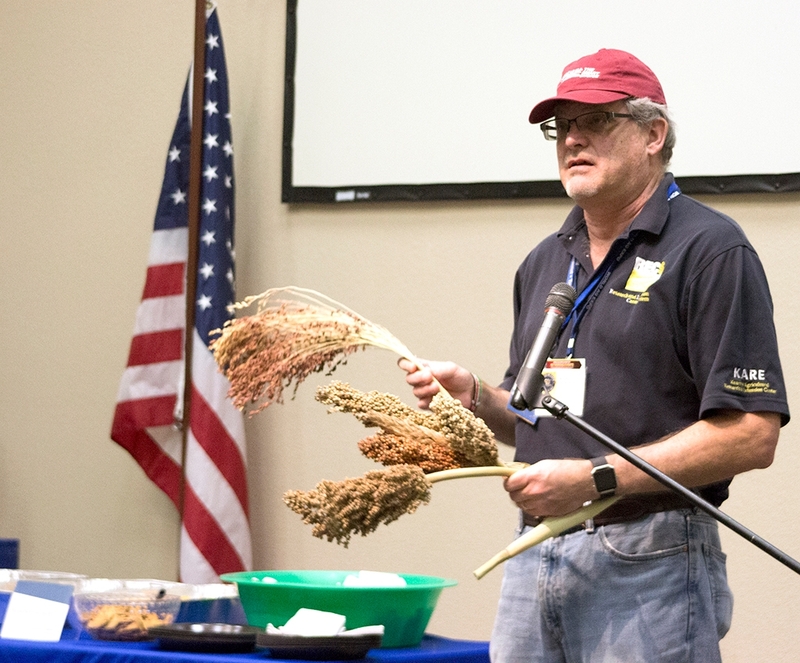 UC Cooperative Extension specialist Jeff Mitchell noted the challenges that farmers face in making soil care changes. “A real part of the challenge for California farms is the high-value nature of the production systems, the crops themselves, and some difficult challenges in terms of the diversity of the crops," he said. UC Cooperative Extension specialist Jeff Mitchell, the chair of UC's Conservation Agriculture Systems Innovation.